Our stretch tent are highly versatile and can be set up in almost any type of terrain. We’re happy to provide you with plenty of floor plan options and tent designs to match your vision. We can help you create an event for any terrain, bringing your ideas to life. Our team will make sure your event runs as smoothly as possible operating throughout South Africa. Want to wow your guests with something a little bit special? Bedouin Tent Masterz are the perfect answer, guaranteed to leave a lasting impression. We are a team of friendly and professionals offering a fantastic range of stylish, innovative stretch tents for hire or purchase. Based in Cape Town South Africa, we can help you create an event for any terrain, bringing your ideas to life. Let’s work together to produce the most inspiring occasion possible. Looking for a tasteful, versatile and unique stretch tents to make your event stand out from all the rest? Try one of our fantastic state-of-the-art stretch tents that add style and create your own touch, enabling you to host your event in the most unlikely of places. 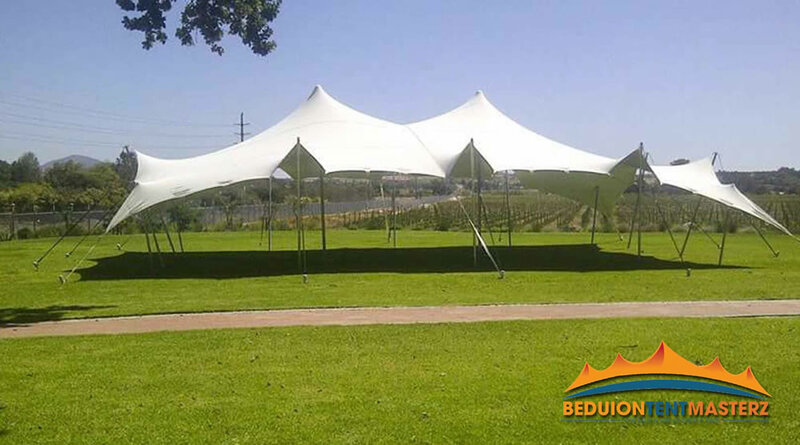 Bedouin Tent Masterz is the fastest growing stretch tent companies, providing you with an expert team of professionals to make sure your event runs as smoothly as possible operating throughout South Africa. Our unique stretch tents are designed to be stretched and manipulated into many different shapes using a waterproof fabric that also prevents sun rays. We use a durable fabric that enables the tents to stand firm through all weather conditions and can be set up on all terrains, allowing you to be creative with your vision. These innovative and stylish stretch tents have been taking the world by storm and it’s easy to see why. Capture the imagination with striking installations for a freestanding tent. Alternatively, we can attach the tents to fixed structures such as buildings or scenery, or even rig them to stages. Our stretch tents contains a built-in fire retardant, anti-bacterial treatment and UV stabilisers. These structures have been certified to worldwide safety standards, meaning they are more durable and can resist the harshest conditions, as compared to other products on the market.